If your business is ready to transition to a new ERP system, one of the first decisions you’ll need to make is whether to invest in an on-premise or Cloud ERP system. Should you choose Cloud ERP, your next step would be to decide whether you want a true Cloud ERP system or a hosted ERP deployment. At first glance, the two seem alike. Both options are easily accessed via an Internet connection. Some ERP vendors and platform representatives may even use the two terms interchangeably. But true Cloud ERP and hosted ERP deployments are not the same thing. Each comes with its own pros and cons, so you must decide which is the best fit for your business. 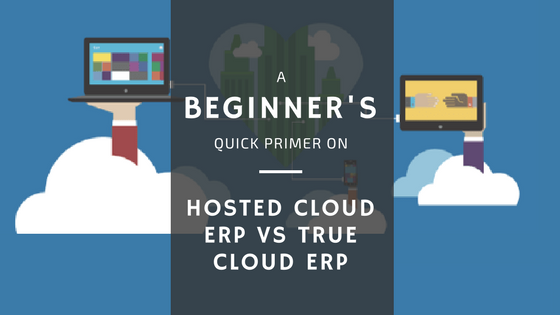 First, hosted ERP systems are not 'true' Cloud ERP systems per se. Through virtualisation, you take your current on-premise ERP software and host it remotely on a Cloud service platform. Examples of ERP systems with on-premise options include SAP Business One, Microsoft Dynamics NAV, and Sage 300 ERP. The benefits to this are many — decreased downtime, improved (or established) remote login, built-in disaster recovery, and a minimally scalable and elastic resources i.e. no more worrying about load times during peak traffic, as long as your monthly plan meets your volume. Also, some Cloud service platforms further add value to businesses by providing additional tools, extensions, apps, and services that increase flexibility — and reduce the ongoing development and/or customisations budget. Microsoft Azure is one such example. Formerly known as Windows Azure, Microsoft Azure offers businesses a unique suite of integrations and extensions in a secure, stable environment. Read What is Microsoft Azure, and How Can It Help My Business? Unlike hosted Cloud ERP, 'true' Cloud ERP systems are designed for the Cloud right from the start. Coded to perform as a fully hosted solution that's managed across multiple servers, true Cloud ERP systems have multiple data redundancy levels set in their own multi-tenancy Cloud environments. Companies using true Cloud ERP will thus be able to access the same solution from the Cloud. Not only does this give them continuous and easy access to upgrades, they also benefit from shared resources and a centralised infrastructure that can improve utilisation and efficiency by as much as 20%. In addition, good true Cloud ERP systems give you options to add customisations within their platform — all while ensuring your customisations continue to work with every new software upgrade. One excellent example is Dynamics 365 Business Central, which is Microsoft's latest true Cloud ERP and business solution offering that launches in Singapore mid 2018. You can add the business apps you want from Microsoft's AppSource to integrate with Business Central, so you get the right solutions tailored to your industry. In other words, you'll never need to worry about manual increasing or paying for an increased load capacity. With a true Cloud ERP system in place, you'll experience a maximum of scalability and agility. There's a lot of technical information out there describing the differences between the two systems. For the average layperson, this can get quite confusing. Both hosted Cloud ERP software and true Cloud ERP software allow you to remotely access your ERP system anytime and anywhere, as long as you've an Internet connection in place. But suppose all things are equal, and having quick anywhere-anytime access is your only factor for consideration, then which approach would work best for you? With hosted ERP systems, you get higher levels of customisations and the flexibility of moving other server resources to the same Cloud platform. True Cloud ERP systems on the other hand, tend to standardise their workflow and features, and 'enforce' this standardisation on their users to follow. Any customisations in a true Cloud ERP will have to be acquired or built outside of the software (e.g. purchasing an app in AppSource). ERP systems hosted in the Cloud also give you the flexibility to move back to an on-premise server should you decide you had enough of hosting it in the Cloud. True Cloud ERP systems like NetSuite or Microsoft Dynamics 365 Business Central however, are sold on a subscription basis. Once you stop paying for your subscription you lose access to your company data; moreover, you cannot suddenly decide to switch to an on-premise version halfway through. True Cloud ERP system software upgrades/patches/enhancements are automatically done by the software provider. You can be on version 1.0 today and be on version 2.0 on the next day with very minimal downtime and disruption. This is more convenient and less time-consuming compared to hosted Cloud ERP systems, which typically require a solutions providers (like us, AFON) to plan and schedule with you in advance for each upgrade. Also, as mentioned earlier, you'll have to work within the 'vanilla' best practices of the true Cloud ERP system. Depending on your business requirements, this could make your operations more convenient and efficient if you're not expecting too much customisations. By abiding within industry best practices set out by the system, you're keeping your processes standardised and simplified. Furthermore, a true cloud integrates almost instantly and depending on the platform provides a wealth of extensions, integrations and ongoing upgrades. This can all be self-managed. Even if you have to hire someone to set a new system or process it is designed to be easy and intuitive. There are more pros and cons between the two setups. But if you're serious about deciding between the two types of Cloud approaches, you'll need to begin somewhere. First, start by clearly outlining your business objectives and by creating a minimum list of must-haves to determine which system will best meet your needs. From there, you can contact a certified Partner like us for a free discussion, and to get advice on the best options available for your business. You can also download our guide from Microsoft on online ERP software below — it's free! Alythea is the Marketing Manager at AFON, where she covers marketing strategy and communications. Alythea also writes on workplace productivity, and is a certified solutions focused coach. Get your ERP software questions answered. Talk to our consultants today. AFON Pte Ltd. Copyright 2019.